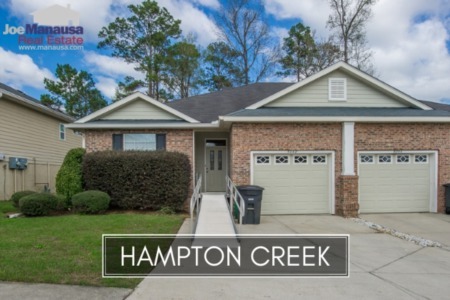 Hampton Creek, on the Southeast side of the Tallahassee real estate market, is a newer community that contains a mix of single family detached homes and townhomes, with prices very near the median in Leon County. Roughly 220 homes we constructed over the past ten+ years. With many people buying the properties at one time (which coincided with the peak of the housing market), we must be concerned that this will leave too many owners wanting to move at roughly the same time. This threat of pent-up supply is highly likely to occur over the next five years. Hampton Creek is located on Apalachee Parkway just beyond Conner Blvd., and current residents find its convenience to town and like-new homes both great reasons for living here. In this report, we will look at long term average home price trends, value trends, and size trends of homes sold in Hampton Creek, as well as all current listings in the Tallahassee MLS and all closed home sales going back to the first year that homes went on the market here (2005). For each of the three graphs utilized in this report, we plot the number of closed home sales for each year (red columns, measured on the left vertical axis), and an important real estate trend shown in blue (measured on the right vertical axis). It is important to note that the narrative contained below is for sales through December for all previous years, but through the second week of February in 2016. The graphs and the closed sales table will be continuously updated into the future (meaning bookmark this page if you always want to know the current status of homes in the Hampton Creek). Average home prices dropped 3% in Hampton Creek in 2015. If you've been sitting to buy a home, consider this a good time to use historic low mortgage interest rates to buy a like-new home cheaper than it would cost to rent. Home sales activity was consistent with what has occurred over the past 8 years, which means a level at less than a third of the pace we saw when the neighborhood formed. This is where the concern for the pent-up supply is founded. In 2015, there were 16 closed home sales in Hampton Creek with an average sales price of $140,456. Average home values in Hampton Creek declined nearly 3% in 2015, which is mostly due to three distressed sales, one significantly below market, and 2 others that were relatively low. Last year, the average value of a home sold in Hampton Creek was $107 per square foot, which means that 2015 created a new market bottom for this neighborhood. Many homeowners who have purchased or refinanced in the past 11 years most likely have no equity in their homes. Unfortunately, lower values make it even harder for homeowners to sell, thus our concern for pent-up supply accumulation. The average home size sold in Hampton Creek typically falls in a range of 1,200 to 1,500 square feet, and 2015 was not any different. The 16 sales in 2015 averaged 1,309 square feet. 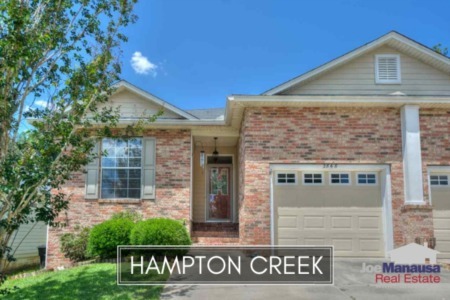 The following map and list of homes are the most recent listings in Hampton Creek. This list is updated every 15 minutes, so you can be assured that this page will always bring you the most up-to-date listings and sales that can be found for Hampton Creek (bookmark this page if this is an area that you want to track). The following list shows roughly 300 home sales in Hampton Creek going back to the very first one which occurred in 2005. I hope you enjoyed our February 2016 update on home sales in Hampton Creek, please feel free to drop me a note if you have questions not covered in this report.